Crafted with extraordinary attention to detail, this mesmerising design is precision set with a 0.70cts Cushion cut Diamond, and is encircled by a halo of outer Diamonds. 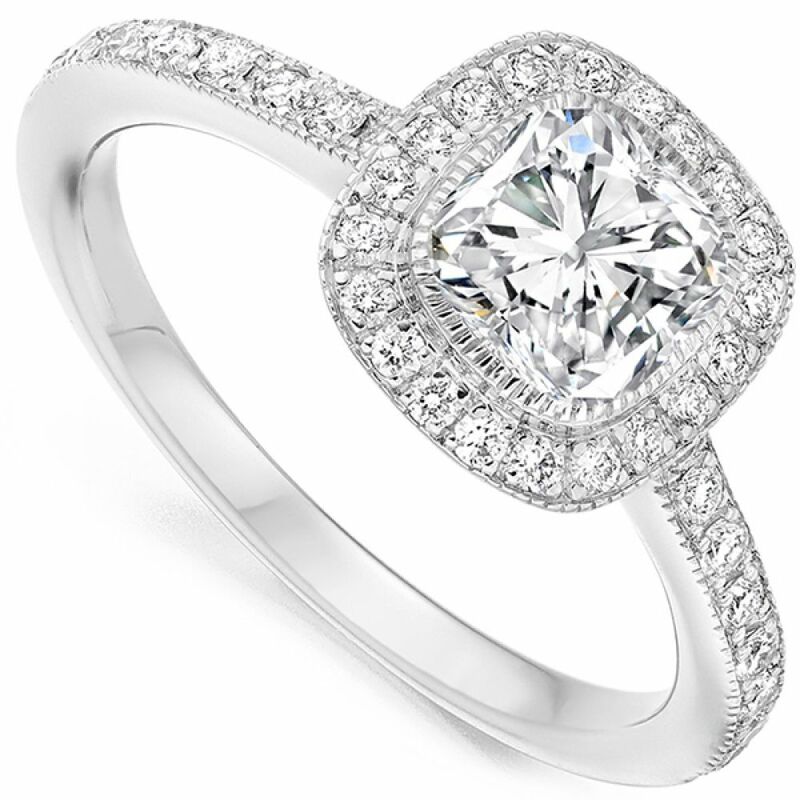 This sits above grain set Diamond shoulders which continues the style right through the whole design. The halo adds an additional 0.35cts of Round Brilliant cut Diamonds, to accentuate the central Cushion cut Diamond perfectly. This intricate ring design benefits from a Wedding Ring friendly setting which allows a straight Wedding Band to sit perfectly alongside in harmony with the design. Available in a range of precious metals, choose from 950 Platinum, 950 Palladium, 18ct White Gold, 18ct Rose Gold and 18ct Yellow Gold. This ring design can also be created in single colour options. We craft your ring over a 4-week duration, before hand delivering your parcel by secure courier, beautifully boxed – ready for the perfect occasion.